Since the old Steak House at Knott's Berry Farm recently reopened (under the name "Spurs,") I thought this might be a good time to post some older photos of the place. 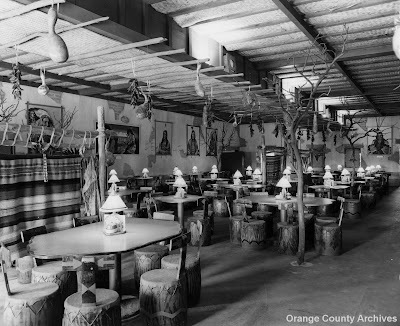 The image above shows the restaurant's Indian Room in 1958. The Steak House originally opened as the Buffalo Steak House in 1946. 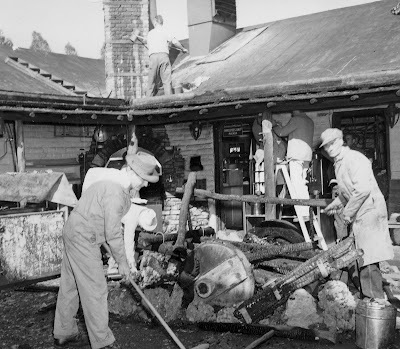 Much like Mrs. Knott's Chicken Dinner Restaurant, it grew like Topsy over the years. Additions included a new kitchen and the Family and Garden Rooms in 1952, the Walter Knott Room in 1962, and more construction in 1971. 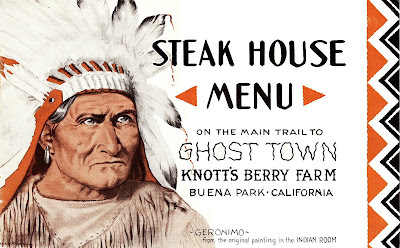 The Steak House also shared a kitchen with the Ghost Town Grill, which was (and still is) more of a short order coffee shop. 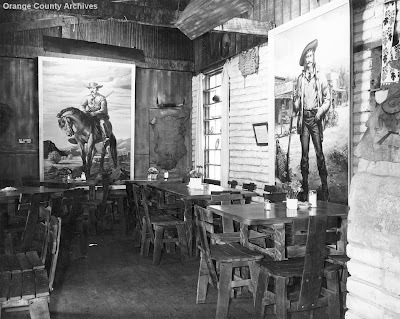 In 1983, the Steak House was renamed Big Jake's Ranch House. This was likely a reference to the John Wayne movie Big Jake, which held its premiere at Knott's in 1971. The name eventually switched to the Family Steak House, but things were about to change. When the Ghost Rider rollercoaster was built in the 1990s, it changed the layout of Knott's Berry Farm significantly. Suddenly, the Steak House was inside the gates of the park, and management felt that a high end restaurant couldn't support itself with such limited public access. The restaurant became Auntie Pasta's in 1998, serving Italian family fare such as pasta and (pretty bad) pizza. Spurs circumvents the access problem using a system you can read about in a recent Register article. Ha! That sure does look like Russell. It was a family affair, after all. Chris that was Russell Knott cleaning the soot of the stack. Neat! Great to see more information about this fire. Sunset Beach, HB, Knott's, Shirley de Graaf, etc.